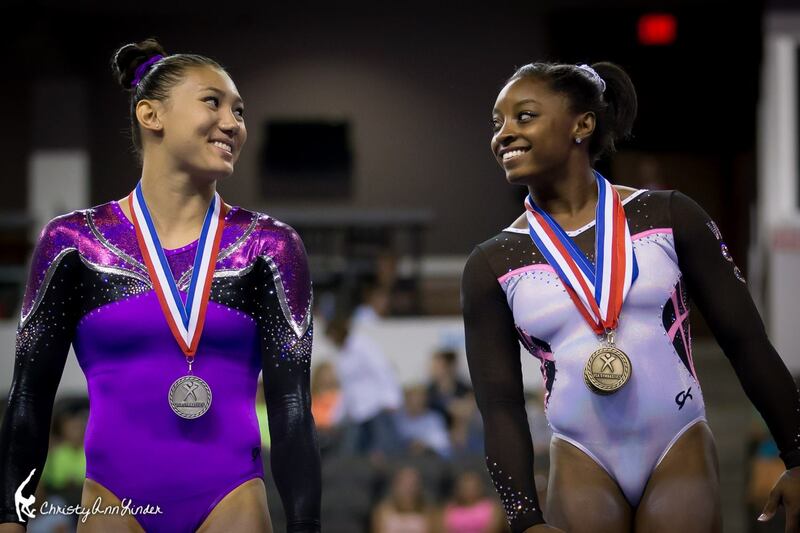 Kyla Ross and Simone Biles are all smiles on the podium at the 2014 Secret U.S. Classic. 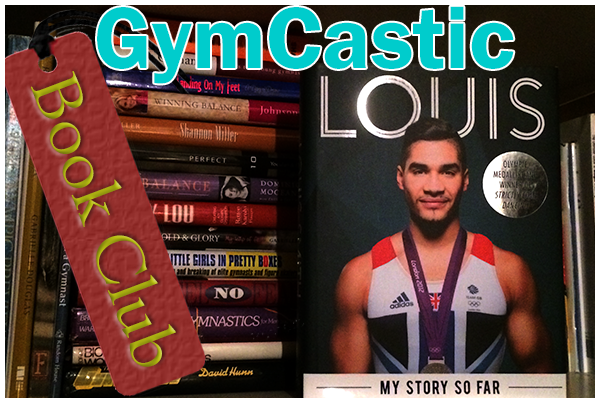 Louis will be our very first GymCastic Book Club guest in August. When: Submit your questions and we’ll ask Louis when he’s on the show in August. Simone Biles has committed to UCLA, will she compete or be tempted to go pro? Lauren thinks MyKayla Skinner should use the Frozen song instead of her current music. See it here. Our favorite moments, skills, newbies to watch and veteran heart breakers. Does a win at the Secret Classic predict future success – Uncle Tim tells us with a quiz. New trends in choreography, artistry and skill combinations. Our high hopes for bars, could the US medal drought on bars may be over? The bonuses were in effect for the US Classic and where do the ladies rank internationally? Why Kyla Ross and Simone Biles would be perfect running mates for presidency in 2028-ish. Lauren Hopkins is at The Gymternet. 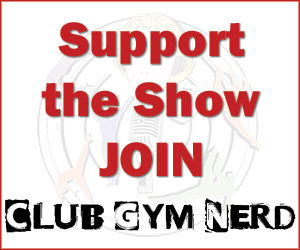 Read Spencer’s analysis on The Balance Beam Situation. Here is the video of Simone Biles doing Kyla Ross’s choreography in the background during the Secret Classic. Or watch on YouTube seniors or juniors. Hahaha Jess as soon as I heard Simone was going to UCLA I just KNEW you were gonna respond like that and I couldn’t wait for it to come on the show hahahaha you made me cry laughing!! I’m personally not a huge USA fan but somehow I’m in love with Rachel Gowey and Jazzy Foberg so I’m glad I watched Classics anyway 🙂 Always good to know what everyone is doing! Hope to see some more surprises at Nationals. Uncle Tim’s story about his niece doing giants on the Tumbl Trak equipment in the basement reminded me of some of the crazy gymnastics I did when I was a kid. So my grandpa built my sister and I a bar in the woods, which consisted of a pipe between two trees. The pipe spun, so he drilled a hole through the middle and put a nail through it so the pipe wouldn’t spin anymore. And we put hay and mulch on the ground for padding. Ya know, real safe. So anyway, two of my gym friends were at my house and we were all learning giants at the time. We decided to practice, with two of us spotting. In order to be tall enough to spot, we stacked pieces of wood on either side of the bar. (My parents heat their house with wood, so the wood pile was nearby.) We did manage to do some successful giants, and somehow did not die. Looking back, I can’t believe we never got hurt doing all the crazy gymnastics we would do at home. Story of every gymnast’s life, I’m sure! I was thinking the same thing! I vaulted over 4ft rolled hay bales off of my mom’s jogging trampoline into piles of loose hay. I started with handspring variations, and towards the end I could do a piked tsuk. Looking back, it was so dangerous. I’m a little surprised you guys didn’t talk about Lexy Ramler’s bars! Her legs got a little bit crazy on the Bhardwaj but that Comaneci was to die for! And the slow, smooth rhythm of her routine and that BEAUTIFUL toe point! Not to mention, she’s tall enough (as a junior!) to just jump from the floor to the high bar for her mount! Can’t wait to see her as a senior. Even if she doesn’t have the difficulty to be a UB star for the US, she was a pleasure to watch! I agree, she had a memorable routine! But she really doesn’t need to be a star of anything right now since her goals are geared towards next quad. Right now its about cleaning up her elite skills and connections and maybe working on a few new skills to add later on down the line. Her difficulty is fine right now since she doesn’t turn senior till after Rio. Atleast she won’t burn out like Chiles will. She’ll emerge as a senior fresh and “new” and everyone will wonder where this lovely lady came from and then they’ll look back and realize that she was always awesome but she didn’t have the difficulty back then to grab their attention. BTW Margzetta Frazier had 51.7 at American Classic,missed qualifying by just .3 not more than 3 as Lauren said on podcast. She must have been thinking of someone else. Maybe she was thinking of the other black girl competing Shilese Jones who went from 48.65 to 54.05 an increase of 5.45. Shilese had falls on multiple routines at American Classic which she did not have at Secret Classic.